St. Scholastica's Concert Band will celebrate the service of veterans with a concert at 2 p.m. Saturday, Nov. 10, in the Mitchell Auditorium. The concert band will be joined by the 34th Infantry Division "Red Bull" Band of the Minnesota Army National Guard. The program will feature music from America's heritage, including patriotic selections and folk songs. Admission is free for veterans and $5 for the general public. 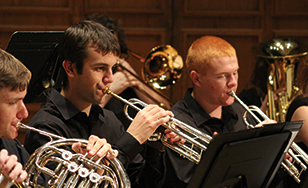 The next band concert in the 2018-19 Spotlight season will be at 3 p.m. Nov. 11: Horns and Voices: A Century of Popular Music. The Jazz Band and Vocal Revolution vocal group will explore great instrumental and vocal music from the 1920s to present.